KRider (629kb ver1.7 made 08/06/2014, no install .zip) is a very small Japanese coffee break game or desktop toy. 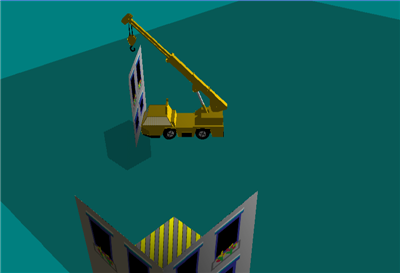 It's a very basic 3D crane simulation with some simple sound effects. The object of the game is to build a house. The house consists of 4 per-fabricated walls and 3 roof sections. You must control the truck as well as the cranes telescopic arm and hook. The arm can be moved up, down, swivel left, right,extend and retract as well as the hook being raised and lowered. It all sounds simple yes? Well it is in a way once you are familiar with controls. You will need to be exact when picking up and placing the walls and roof section but don't worry, there is a lite grey box that will show you where you should be to pickup and place all sections. I doubt this little sim will last long on any gamers PC but I'm sure the kids will get some enjoyment from it. All up it should take you about 20 minutes to finish but it feels and looks very incomplete. Some background images, a sky image, small roadway and object to avoid would have made this feel much better. Maybe these features are on the way or it may be part of something bigger, who knows.